If families with small children were a bit scary, we soon got to face another hard to please -age group of teenagers in Helsinki. Our 3 forest tour of Herttoniemi, Hallainvuori and Kruunuvuori forests in Helsinki was organized by Eastern Culture Center Stoa. They also organized a culture course for 13-14 year old students, and a part of the course program was to come and see our show and us visiting the schools afterwards to discuss with the younsters. The energy of the shows was of course again different, but I was personally very impressed about how well the performances went. Again, we are touching subjects that are probably a lot on the mind of teenagers, and maybe not from the point of view they are often proposed them while growing up. The performances included a bit less reactions and a bit more giggling, but they also went well after we relaxed again. Us visiting the schools was a valuable experience as well. We were telling them not just about the performance, but also about our lives as circus artists, how we came to where we were now, and why we did the project we did. I hope it provoked some thoughts in them, or at least showed a window to a life that they maybe did not yet know was possible to have. At least for myself growing up I believe it would have been great to see someone who did a different path then the one of studies, money, loans, a fixed house and a family like from the textbook. For myself, to actually also have seen a woman doing things, doing arts, actions, acrobatics, focusing on something else on being pretty in the background, would have been very inspiring. I’m not sure if we were the good people to reach these youngsters, but I felt like we at least were the school visit I would have liked back in 2002. 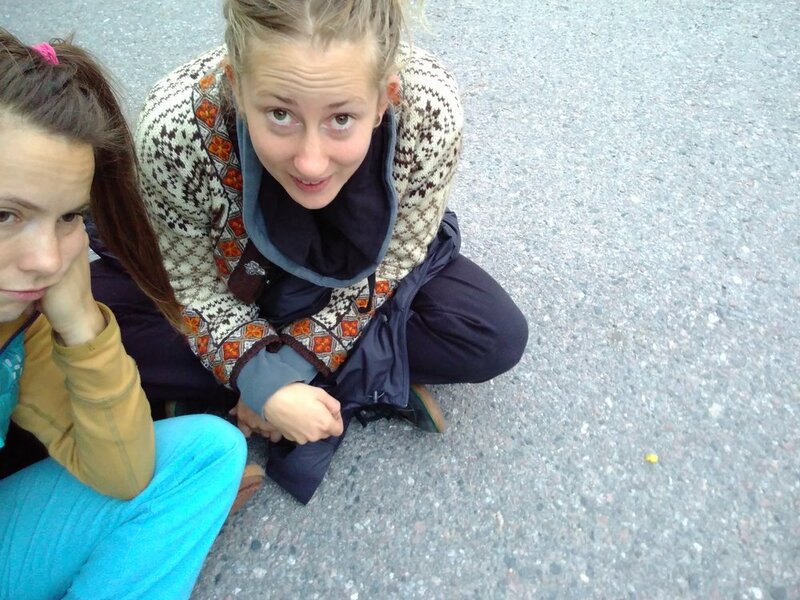 Here we are after 2 shows during the day, spending quality time on our asphalt backstage. Another interesting experience in the Helsinki tour was that we were very much in the middle of the city in these forests. In every one of them, you could hear the traffic from the big roads next to them. This was nice, because maybe it would make the people also see that to visit a forest you don’t necessarily have to go far to the countryside. Helsinki of course is quite a special capital in the sense that one can have a real nature experience less than 10km from the city center. 5 shows in a week was quite a tough working schedule, since it was every other day shows and rigdown, every other day rigup, but it felt nice to really feel like touring with the performance. Kruunuvuori beauty from the last performance day. And here we are happy in the sunset after 5 successful shows in Helsinki!